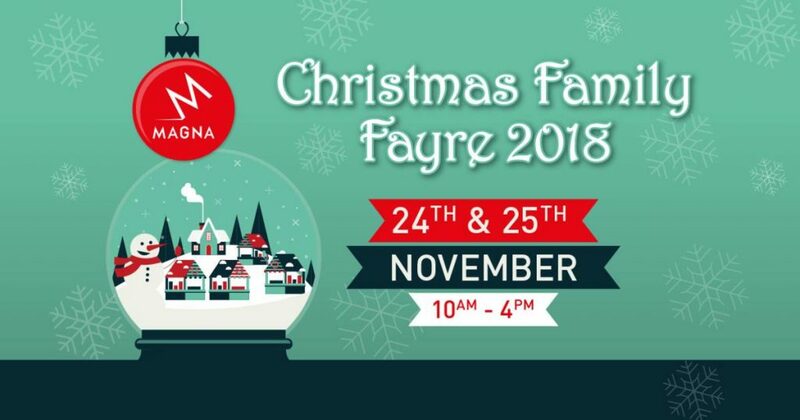 Magna’s Family Christmas Fayre 2018 will include a santas grotto this year. The fayre is open Saturday 24th and Sunday 25th of November 2018 10am-4pm with over 60 stalls, family entertainment, plus entry into Magna and outside play areas. 2.50 per adult and includes one free child. Additional children are £1. Free parking. Grotto costs an additional £4.95 per child and includes small child’s gift. Santa and his Elves will be at The Tropical Butterfly House from 17th November-24th December on weekends, then daily in Christmas school holidays. Santa’s grotto is open 11.00am – 4.00pm with allocated 5 minute slots only, if you would like to purchase a wrapped present from Santa this will be an additional cost of £7.00 payable on admission. 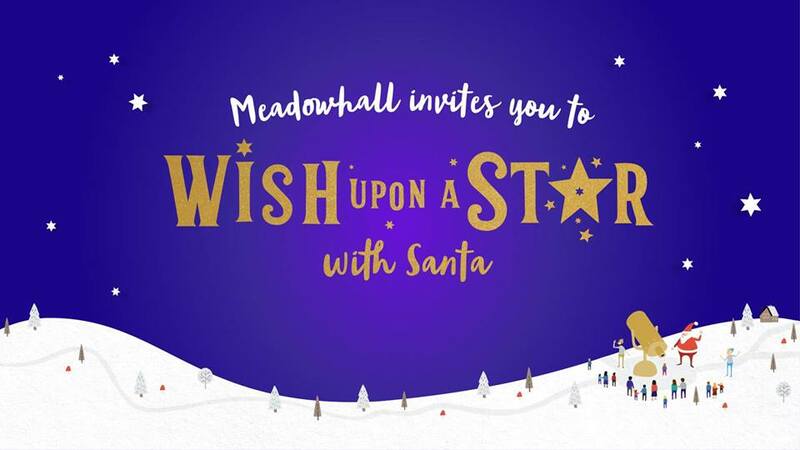 Wish Upon A Star at Meadowhall, Wednesday 21st November – Chistmas eve. Wish Upon A Star Elves will transport you and your children to a snowy Wishmas Wonderland. An immersive theatrical experience filled with storytelling, stargazing and enchanted encounters. Children can craft their own Wishmas star to take to Santa in his grotto. Children are £6.00 booked online (+60p booking fee per ticket) for a 40 minute experience. No walk up slots available, make sure you book online! 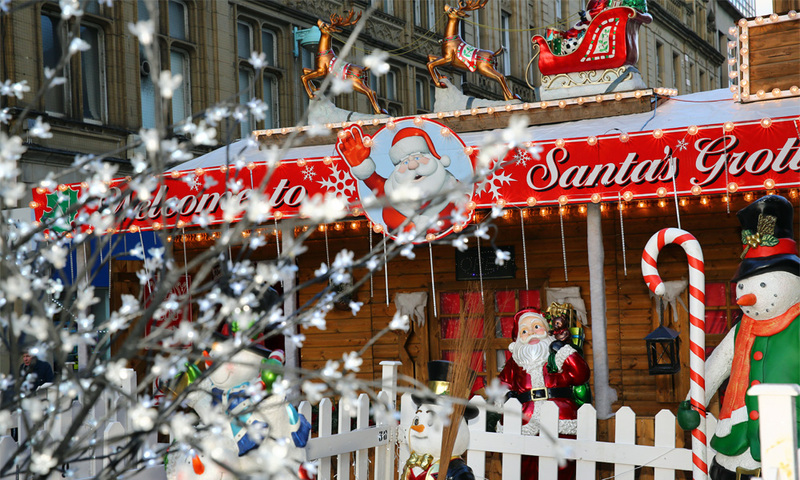 The popular city centre Santa’s Grotto is on daily from 15th November. The grotto is in the Peace Gardens this year, surrounded by the festive Christmas Markets and rides open from Thursday 15th 2018. Crystal Peaks santas grotto includes a 4D cinema experience from 17th November-Christmas eve. Visit Santa and his elves in his grotto, experience the festive 4D film and receive a gift. Timed slots to book online. Adults £1, children £5.50. Santa at Weston Park Museum is always a popular grotto! Santa will be at Weston Park Museum daily from 1st December-Christmas Eve on selected dates (Sunday-Monday). Santa will be in the transformed Santa’s North Pole ho-ho-home in the Weston Park’s Arctic World Gallery. Tickets are to be booked online with a time slot to reduce queues times. £7 includes a gift. 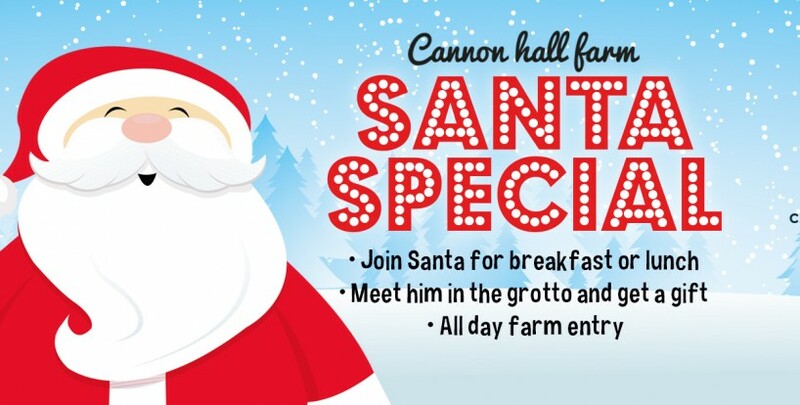 Enjoy breakfast with Santa at Atkinsons Restaurant on Sunday 16th December, 10:30am. Tickets are £14 each child and include Weston Park Charity donation, selection box and present from Santa. 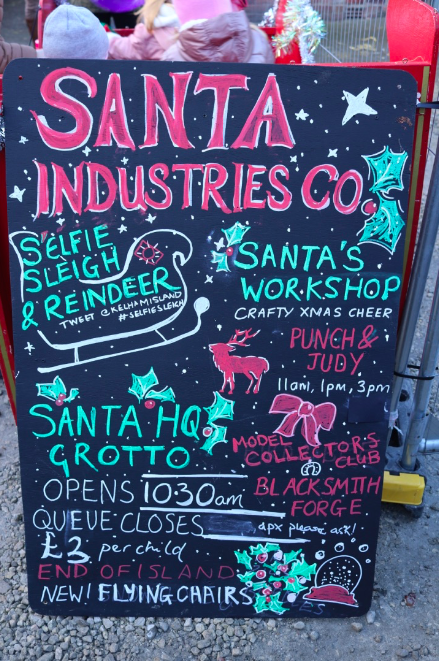 Santa will be at Kelham Island Museum Christmas markets on December 1st and 2nd. Magical Makers Emporium will feature over 120 stalls, food, family crafts, carnival workshops, performers stage and much more. Adults cost £6 into the markets, and last year the grotto was an additional £3 per child. There is real reindeer! 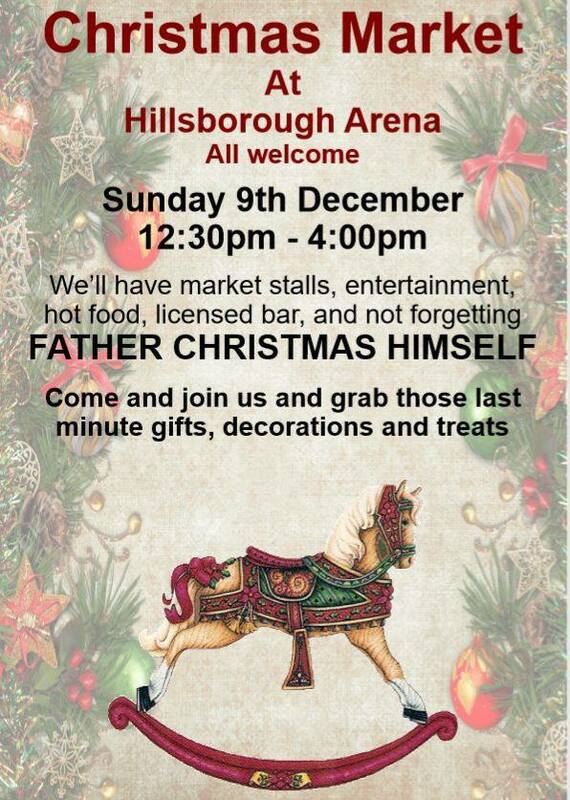 Hillsborough Arena have a grotto at the Hillsborough Christmas market. Sunday 9th December. Santa will be there 12.30-3.30, Tickets £3 each with gifts for all. Santas grotto at RSPCA Attercliffe Christmas fair, 17th December. The grotto will be open from 10:30-3pm. £1 adults into the fair, grotto £2 per child. Towsure Sheffield has a FREE grotto, open daily from early December (details to be announced). Towsure have confirmed the grotto will be back this year. 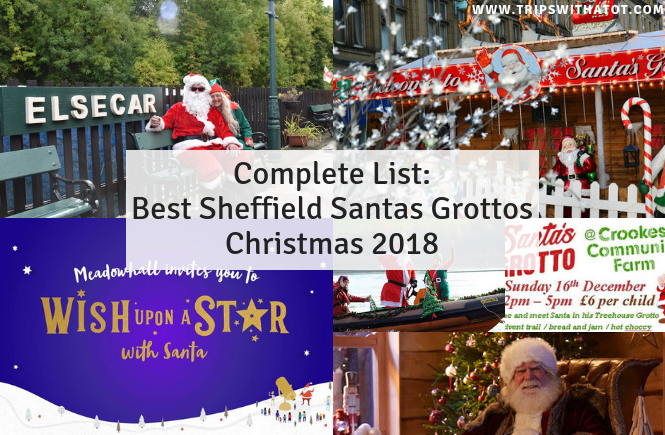 in 2017, the free grotto included a gift for the child plus free mulled wine in the cafe for adults. There is Christmas decorations, free parking and Towsure is next to Malin Bridge tram stop. Report back for full details TBC! 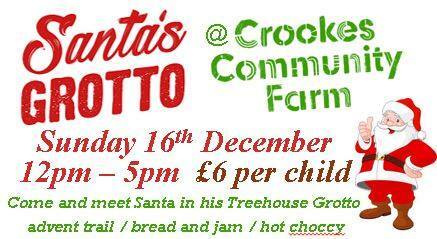 Meet Santa in a Treehouse at Crookes Community Farm, Sunday 16th December. 12-5pm, £6 per child. 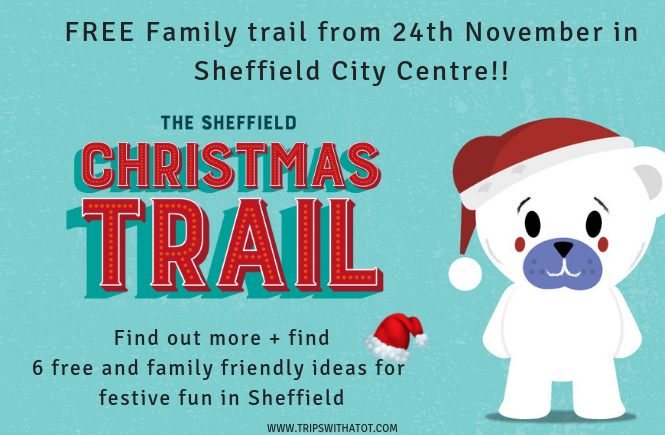 They’ll be an advent trail, bread and jam, hot chocolate & coffees and a festive raffle. Organised virtual queue should limit waiting times. 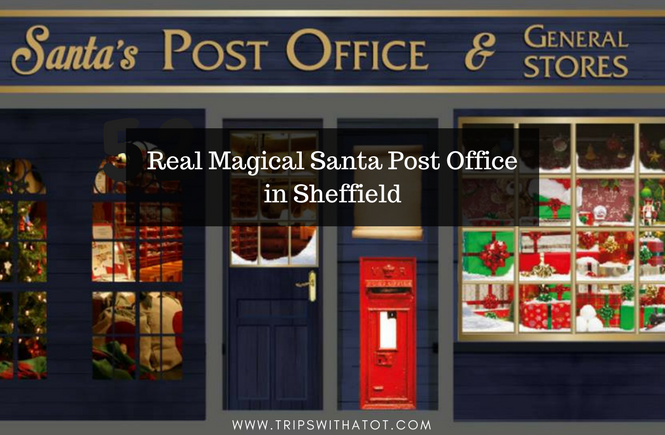 How about a train ride with Santa instead of a grotto? 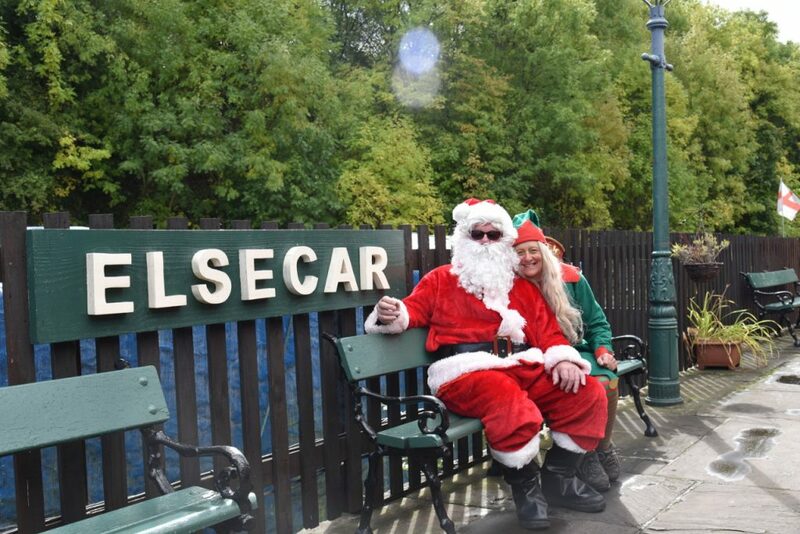 Santa will be on the Elsecar Heritage Railway trains on selected dates in December. Have a ride from Elsecar Station where Santa will make his way down the train stopping to chat with everyone. £14 per person includes a gift for a child, hot drink/juice and biscuit. Wentworth Garden Centre & Family Farm, S62 7TF. Father Christmas at Wentworth will be arriving in a carriage on Saturday 17 November at 10.45AM. He will be in his toy workshop each weekend until Sunday 23rd December, 10am-5pm, Monday to Friday from November 26th until December 22nd1.00PM – 5.00PM and Christmas Eve 9.00AM – 4.00PM. Father Christmas is priced at £10.95 per child and includes a present and entry into the Family Farm for up to 2 adults and a child. 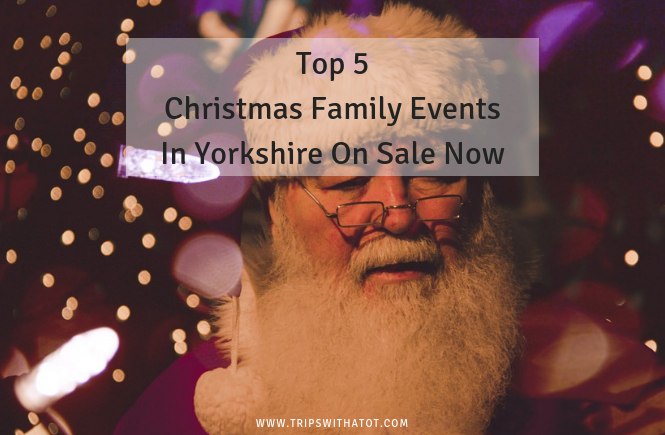 An Audience with Father Christmas at Brodsworth Hall, Sat 1 – Sun 9 Dec 2018, weekends only. Gather around the Christmas tree for a story with Santa. Each child receives a gift. Selected time slots of 10.30am, 11.30am, 12.30pm, 1.30pm and 2.30pm. £5 per child (normal entry to Brodsworth Hall applies). 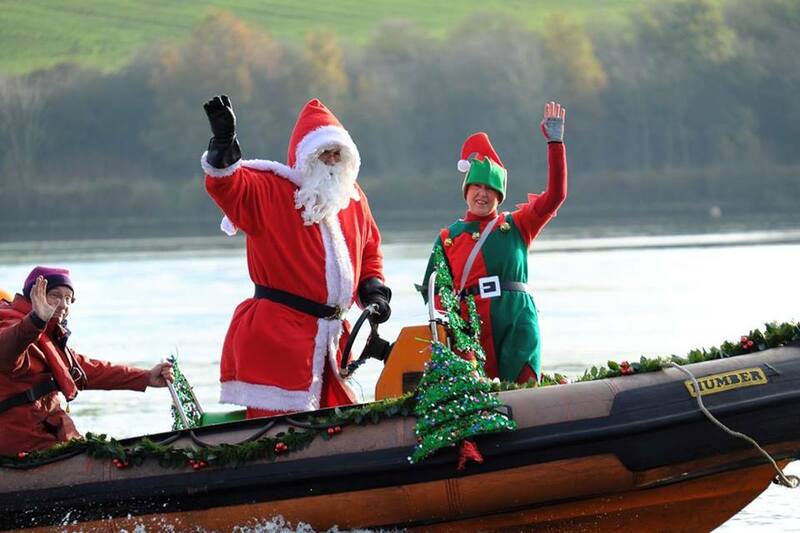 Santa will arrive on a speedboat at Thrybergh Country park Christmas Fayre on Saturday 1st December. 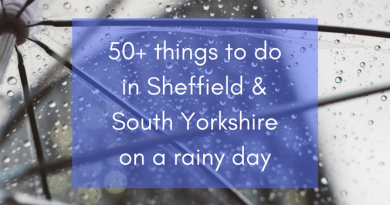 They’ll be music, drinks, food, fairground rides and craft activities. Santa costs £3 including a children entertainer/show and a gift. Wentworth Woodhouse Christmas Market on 7th December-9th December features a santas grotto. Grotto costs £5 per child and includes a gift. Adults £5 entrance. 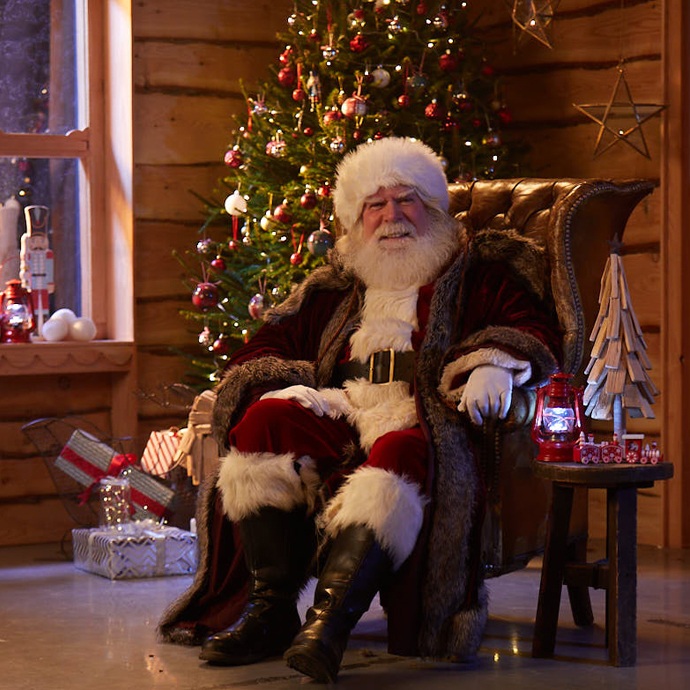 Visit Santa in his grotto at Dobbies Garden Centre, S43 4XN, 8 November 2018 – 24 December 2018. Tickets cost £11.99 and include a high quality toy such as Playmobil, Lego and Bigjigs. Firth Park Christmas fair and fireworks, December 2nd, will be having a grotto – Santa’s grotto will be open 12 – 4pm in the pavilion and the cost this year will be £2.00 per child. Santa will be arriving by Helicopter to his grotto at Clifton Park Christmas fair on 1st and 2nd December. Burton street foundation market on 18th December, the grotto is open 11.30-13.00 and 14:00-15:30, and the cost is £2.50 with a gift. In 2017, grottos were at Hillsborough Exchange and Aston Springs Farm but there is no information on these just yet. 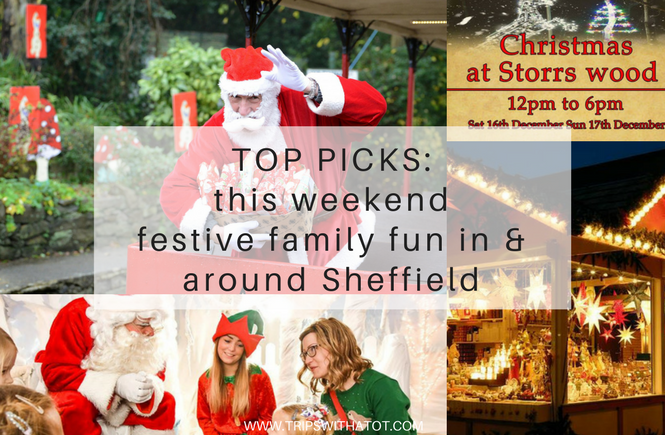 Keep checking back with further updates and more grottos, plus a Best santas grottos in Yorkshire list, the best Christmas events in Sheffield and south yorkshire, festive days out, Christmas markets and much more. Subscribe so you don’t miss these posts.